The Gift came to reside on my shelf a few years ago after I was given a free box of books at a yard sale. Normally, I would have tossed it in the donation pile, but I have a soft spot for holiday books, even if I'm not the biggest fan of the author. The novel opens with the story about five-year-old Annie Whittaker and her family. Annie's mother Elizabeth was 41 years old when she gave birth to Annie, who apparently, according to the narrator, was the sweetest, most angelic child for miles around. A few days after Christmas, Annie dies unexpectedly of meningitis, and her parents and brother Tommy drift apart in the year following her death amidst their grieving. A few months after Annie's death, in a neighboring small town just a few hours away, 16-year-old Maribeth goes to a school dance and leaves with a popular senior jock. After some groping and fondling happens in his car at the local look-out point, Maribeth becomes pregnant, and her father kicks out her out of the house and sends her to a convent to give birth. Feeling lonely, unhappy, and unloved, Maribeth runs away again in pursuit of a new life and a fresh start. After Maribeth settles into a new town as a waitress at a local diner, Maribeth meets Tommy. Almost instantly, he sad duo fall hopelessly in love with one another. As Maribeth is welcomed into the open arms of the Whittakers, she learns more about what she really wants from life after her baby is born. Danielle Steel has an interesting writing style I've never seen in other novels. There might even be a term for this type of writing, but I've no idea what it is. In the middle of a paragraph, Steel has a tendency to switch character perspectives. For example, the first half of a paragraph will describe Tommy's thoughts, and the second half of a paragraph will describe Maribeth's thoughts. The end result is confusing, hard to follow, and just not very great. Plus, the story is predictable, which makes The Gift just a so-so, happy, feel-good holiday read. There isn't anything phenomenal about the story, and I'll probably never think about this book again. I'm sure anyone can read the synopsis and guess what happens to Maribeth, her baby, Tommy, and the rest of the Whittakers without having to read the novel. 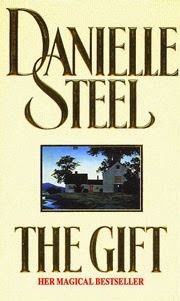 I can definitely say without a doubt that I'll probably never read anything else by Danielle Steel.